The travel industry is heading toward a mobile future, as more travelers are choosing to plan their trips on their smartphones, according to an executive at hotel booking site Hotels.com. “We’ve done some studies with millennials and what they’ve told us is that they like the apps for the sake of convenience in particular, but also some of the features, like the filters and being able to book on the app straightaway with a stored credit card,” said Abhiram Chowdhry, who heads the Asia-Pacific and Latin America regions for Hotels.com, in an interview with The Korea Herald. In particular, Korea has become an important market to watch in terms of mobile service development. 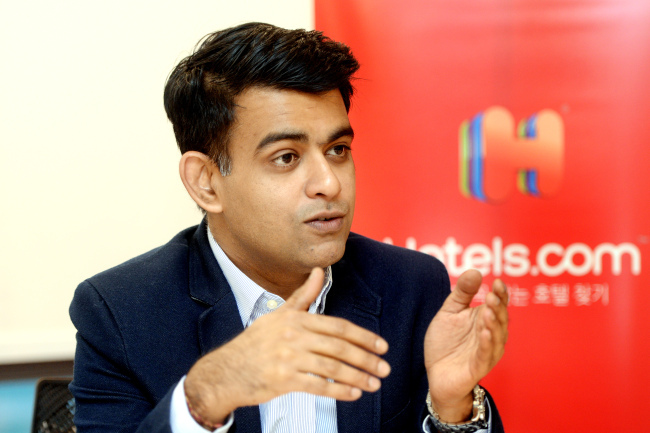 Since Hotels.com entered the Korean market nine years ago, Chowdhry says that the growth of mobile users as well as the number of individual travelers have been particularly noticeable here. “I can say that Korea is among the highest in the (Asia-Pacific) region,” he said, referring to the proportion of users who access the site through their smartphones. Koreans not only access Hotels.com through their smartphones, but also extensively use sorting features. According to data from Hotels.com, Koreans use filter features 30 percent more than the rest of the world. Koreans’ mobile-savvy searches, combined with the rapidly rising number of travelers and unique travel trends, may also give the company new ideas for additional features for the app in the future. “We did a study with our Korean consumers, and found that they like to travel for getting experiences, traveling for theme holidays. That was different in Korea versus other markets,” Chowdhry said. Some examples of theme holidays that he mentioned include spa holidays, culture holidays and “healing” holidays -- and these themes influenced the types of hotels that were being searched. In addition to more sophisticated search features, Chowdhry said, Hotels.com is looking to incorporate more technology into its offerings. “There’s a lot of research going on in terms of voice searches, but also experiments with what kind of media people would like to look at,” he said. The site is also working with its hotel partners to develop services such as keyless entry to hotel rooms, which should be available in a matter of months. “That’s a here-and-now thing, using your app to enter your hotel room,” Chowdhry said. “Anything that we do as far as innovation goes with regards to our mobile apps, Korea will be one of the first markets we’ll be testing that in because it is a mobile-first market. It’s one of the leaders for us in that regard globally,” he said. The travel industry in Korea is changing quickly, Chowdhry said, with not only young travelers but also travelers over 45 making more trips and to farther, exotic places. The rise of low-cost carriers in Korea has also increased accessibility to far-flung destinations, expanding the needs of Korean users on Hotels.com. However, he said, the company was happy to keep up.